Line 13x9-inch pan with foil. Spray bottom and sides with cooking spray. Pour cereals separately into 2 large bowls. In 2-quart saucepan, stir caramels and 3 tablespoons water over medium-low heat until caramels are melted and mixture is smooth (about 10 minutes). Stir in butter and salt. Pour half of caramel mixture into each cereal bowl (about 1 cup for each). Stir caramel mixture and cereal until combined. Using hands lightly greased with butter or cooking spray, spread Kix™ cereal mixture evenly in pan, pressing down slightly. 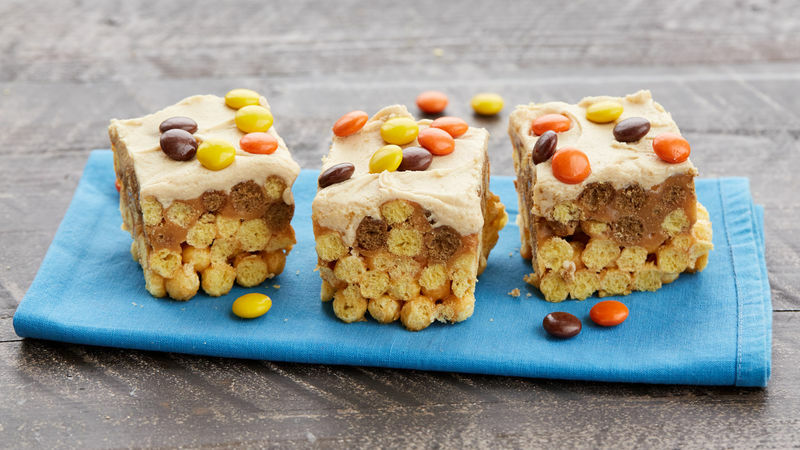 Spread Reese’s™ Puffs™ cereal mixture evenly on top, pressing down firmly. Cool 15 minutes. In medium bowl, stir together frosting, peanut butter and 1 tablespoon water. Spread evenly on top of bars. Sprinkle candy over top. Remove bars from pan. Cut into 6 rows by 4 rows. Substitute Honey Kix™ cereal for Kix™ cereal, if desired. Substitute 1 cup chopped dry-roasted peanuts for Reese's™ Pieces™ candy, if desired.